range of valves for all types of industries. european standards ( EN 1074 / EN 12516.2). following the technical specifications of the customers. are inspected periodically by a third party. Our manufacturing process requires constant control all phases of product development. Foundry to final hydraulic test. Traceability and controls are carried out by spectrometry (relieved heat numbers…). 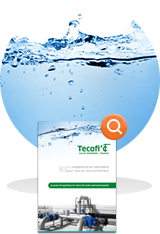 Tecofi can provide all certificates in conformity with the EN 10204 norm : 2.2, 3.1, 3.2 and can provide everything under control specifications of its customers. Tecofi is making all kind of electric and pneumatic assembling in his work shop. We are able to offer custom manufacturing on special requirement. The staff is trained and we are equiped with electric cabinet and adjustment tools to ensure optimum operation of motors. A significant part of our activity is directed towards the water treatment and environment sector. Our products are especially adapted to respond to the needs of purification units (ACS and WRAS certification) as well as the demands of water treatment plants, thanks to our large ranges of butterfly valves, knife gate valves, check valves, diaphragm valves, etc. We have a big presence in the sector of the paper pulp industry, as some of our leading products, like the through conduit knife gate valves and the double gate valves for the pulper outlet, are products that are regularly used by the industrialists in the sector. Our other ranges of ball valves as well as hoses and products for the steam process are perfect complements to be able to provide a global solution to our customers. We have always highly valued projects for the service industries and professionals from the industry, as design departments, fitters and operators find a suitable solution to their needs in our range. Our range of NF and ACS certified brass valves lets you meet the technical demands imposed by the specifications. Our proximity to the Lyon chemical industrial area was clearly an advantage in establishing our initial partnerships with these companies. Our diaphragm valves, plug valves and other lined valves allow us to respond to people in industry area as regards very corrosive applications like acids, chlorine, phosphate or hard working conditions (high temperatures, high pressure).